Rating: 8/10. A Must-buy for any diehard fan of Team Fortress 2. Category: Fad. This Item will pass into obscurity in time. Music is bad. You have a better chance of dying in a blimp accident than of buying a good record. So congratulations, little boy or girl, because you’ve somehow defied the odds. The album you hold in your hands contains the world’s only good music – all the best notes, in the best keys, in the best order, orchestrated specifically for you and your best buddies to hold in each other’s guts by. And there are no lyrics, so there’s nothing to compete with whatever words you choose to scream at the sky while enjoying the smooth sounds of Team Fortress 2. Never change, Valve Writers, Never Change. 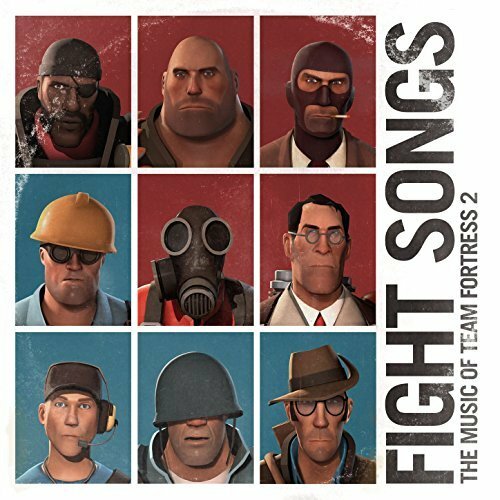 Fight Songs: The Music of Team Fortress 2 is the near decade-in-the-making soundtrack for, well, Team Fortress 2. With 29 Tracks, Artwork and an in-game item to boot, this is a definite collector’s item, but how do the tracks themselves hold out? For the most part, pretty well. Each one seems to be the original source file, which is quite nice, as they are more clear than the gamefile-ripped version I had had previously. However, two tracks: “Scream Fortress” and “Carousel of Curses” (Both of which are Halloween-related.) have issues where the track peaks and crackles in ways that are not apparent in-game or in the aforementioned rips. This is the only major problem, but it is still a letdown. EDIT: This was a problem found on the CD version initially, but it has since been found in all versions of the soundtrack. I purchased the CD copy. The Album artwork contains images of all 9 classes interacting with each other, or on their own in various situations organized like a scrapbook. With the game reaching its 10th anniversary soon, this is fitting, and it even seems to tease at the upcoming Pyro update. Speaking of the Pyro, this album’s case wouldn’t last more than a few seconds in his hands, as the whole thing, save for what is holding the disk, is made of paper. It’s a fragile item to say the least. Your in-game bonus for physical copies? It’s a hat, to no surprise, but one that places a small turntable atop a set of headphones, referencing both the digital and analog versions of the soundtrack release. The record spins while the playhead will bob up and down depending on your character’s movements. A goofy, yet charming addition to an already decent release with an even more fitting name: The Audio File. To anyone who enjoys the TF2 Soundtrack, or TF2 in general, give this a go. Like previous TF2 items such as the Chess Set, this probably will not stay in production for long, so get while the getting’s good!